The combination of electronics and mobility has driven major changes in consumer behavior. The handling of finances is not an exception. The growing penetration of smart devices is pushing banks and financial services companies towards mobile solutions that fit the demands of modern consumers. Innovation has become the watchword as customers increasingly condition their banking choices on convenience and ease of use. 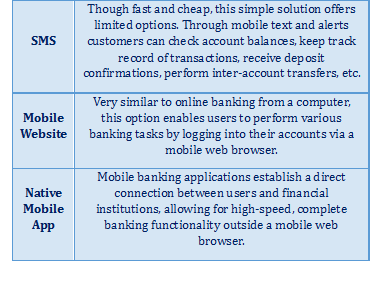 The present article will discuss the emergence of mobile banking, along with the trends and challenges that follow. It will further present the federal R&D tax credit opportunity available for companies engaged in mobile banking innovation. The widespread adoption of digital banking is unquestionable. A Nielsen study from November 2013 showed that the vast majority of U.S. consumers (82%) had banked online at least once in the last 30 days. However, as people spend more time on mobile instead of internet (around 34.5 hours versus 27 hours, respectively, in December 2013 ), a new focus on mobile banking stands out as a major opportunity. 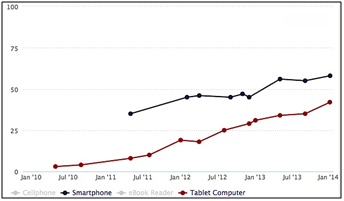 According to Pew Research, as of January 2014, 58% of American adults owned a smartphone and 42% of them had a tablet. The chart in Figure 1 illustrates the explosive growth in smart device ownership over the last four years. In this context, mobile banking is gaining momentum as a less costly and more convenient alternative to traditional means of banking. An Accenture survey found that mobile banking activity increased 50% in the U.S. between 2012 and 2013 and that nearly one third of U.S. consumers do mobile banking at least once a month. The report further highlighted that 20% of customers believed that mobile banking was one of the most important areas their banks should be investing and developing in. Despite recent advances, there is still major growth ahead for mobile banking. Forrester Research expected U.S. mobile banking users to double between 2012 and 2017, reaching 108 million (or 46% of all U.S. bank account holders). Mobile banking is broadly defined as the use of mobile devices, such as smartphones and tablets, to perform banking tasks, such as monitoring account balances, transferring funds, paying bills, contacting management for issues, among many others. The increasing penetration of smart devices has led to a widespread adoption of mobile banking applications. The following image illustrates the availability of such applications in different platforms. 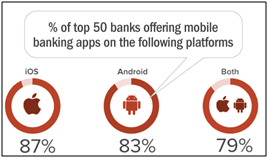 Mobile banking solutions have become key to both customers and banks. Looking for convenient, timesaving, and efficient applications, customers increasingly factor mobile banking capabilities into their choice of financial institution. According to New York-based consulting firm AlixPartners, 60% of smartphone or tablet users who switched banks in the fourth quarter of 2013 said mobile banking was an important factor in the decision. The possibility of rating and reviewing applications in forums like the Apple App Store and Google Play Store has exposed mobile banking providers to the rigorous scrutiny of public opinion. Recurrent criticisms include bugs, no deposit function or low deposit limit, and poor design. 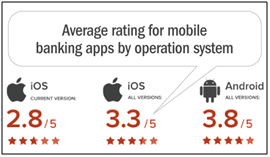 The chart below presents the average rating for mobile banking apps in 2013. Despite the challenge of meeting rising expectations from users, mobile banking applications bring major opportunities for financial institutions, particularly when it comes to cutting expenses. While the average cost of a mobile transaction is only 10 cents, this cost nearly doubles for desktop-computer transactions. More strikingly, an ATM transaction costs on average $1.25. Mobile banking applications also emerge as an important weapon in the battle to retain customers. Not only do they provide numerous gateways to promote customer loyalty but they also serve as data gathering platforms, generating unprecedented information on users' behaviors and preferences. In spite of the bright future ahead for mobile banking, there are still significant challenges to overcome. A 2013 study by Javelin Strategy & Research showed that 41% of customers cite security concerns as deterrents to their use of mobile banking. 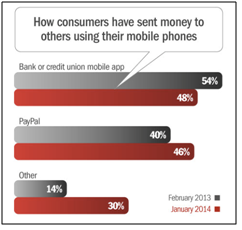 Neutralizing such concerns and convincing doubters is a major challenge for mobile banking providers. Application developers, wireless network service providers, and IT departments must work together to ensure the security of each and every financial transaction. Stolen devices, authentication processes, and encryption of data are among the aspects to be addressed. At a time where new mobile devices are released to the market at an unprecedented speed, mobile banking providers must develop solutions that run well on different platforms (i.e. Android, iOS, etc). Interoperability is still an important challenge in the way of widespread mobile banking. Financial institutions should be able to provide high-speed mobile services without interruptions or malfunctions, thus fulfilling the expectations of high-paced customers. Given the projected exponential growth of mobile banking users, the ability of scaling-up services while preserving full time reliability should become a crucial aspect of competitiveness. Mobile banking is all about keeping up the pace with 21st century customers. By engaging in innovative efforts aimed at responding to users' needs, financial institutions increase their chances of success. Below are some examples of promising areas for innovation. The deposit of checks has been one of the most appealing functions of mobile banking (especially because it cannot be performed through online banking, in ordinary computers). Instead of going all the way to a branch or ATM, customers can deposit their paper checks by snapping a picture of it. This feature has proven so popular among customers that the percentage of top 25 U.S. retail banks and credit unions by deposit size offering mobile check deposits went from 48% in 2012 to 76% in 2013. This successful experience has opened the way to further innovation: mobile photo bill pay. Through the snap of a picture customers are able to automatically add billing information into their accounts. This feature has also proven appealing, as it eliminates the tedious task of manually adding information to one's system. San Diego-based Mitek pioneered the mobile imaging technology for financial transactions, which has been deployed by numerous financial institutions. The company also offers Mobile Photo Payment solutions and the first login-free, data entry-free, bill pay service destined to billers who benefit from dealing directly with customers. Mitek's intelligent mobile imaging is also at the base of the Mobile Photo Account Opening solution, which eliminates the time consuming and error prone task of manually entering data on a mobile device. This user-friendly process consists of capturing a picture of the future client's documents, which are automatically populated into the account opening application. Not only does it encourage self-service mobile opening of accounts but it also improves employee interaction with customers through a simplified in-branch process. A recent research by Novantas revealed that the number of smartphone owners who make mobile person-to-person (P2P) payments increased by 30% between April 2013 and January 2014. The following chart highlights the different means used to perform this task. Due to transaction fees, however, banks are losing ground in mobile P2P, which has been increasingly dominated by non-traditional players. 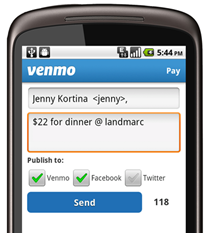 Wallet app Venmo, for instance, allows users to exchange payments with people in their social circle via smartphone at no cost. Customers must link their accounts to a banking account, debit or credit card (there is a 3% fee for credit cards); the app then connects with Facebook friends and email contacts. Transactions happen overnight and are protected by the Federal Deposit Insurance Corporation. As of its public debut in 2012, Venmo was processing around $10 million in payments a month and growing at a monthly rate of 30%. Launched on April 29th in the UK, Paym will allow 30 million bank customers to make payments using a mobile phone number alone. Participating banks include Barclays, Danske Bank, HSBC, Lloyds Banking Group, and Santander. The initiative aims at encouraging and simplifying P2P mobile payments by linking mobile phone numbers to bank accounts and enabling payments through users' contact lists. The advent of mobile technology has opened the banking market to new entrants. Branchless banks and mobile banking services providers are gaining space, particularly among young, fee-averse customers. GoBank, Simple, and Moven are examples of this new trend. Despite marginal differences, they all charge minimal fees, do not require minimum balances, and offer simplified solutions for payments and monitoring of transactions. This new breed of banking is specially designed for mobile, on-the-go users with a focus on what customers want to do, rather than on traditional banking terms. As of February 2014, only 15 months after its launching, Simple had 100,000 customers. Auto-defined as a "worry-free alternative to traditional banking", the banking services provider offers saving and budgeting solutions (known as "goals" and "safe to spend") that help users in their financial decision-making. For now, Simple works in partnership with Delaware-based Bancorp Bank, which is responsible for holding deposits. It should soon however have a new host bank due to its recent $117 million acquisition by Spanish banking giant BBVA. Likewise, funds in Moven's accounts are held at CBW Bank, based in Kansas. The company works through mobile debit accounts specially designed to help improve users' financial health. Connected to a wide range of available services (debit card, ATM, P2P system, PayPass sticker, etc), Moven's mobile app provides instant feedback on every transaction made. GoBank is the mobile banking division of the Green Dot Corporation, issuer of prepaid debit cards and owner of Green Dot Bank, which holds money deposited in GoBank's accounts. 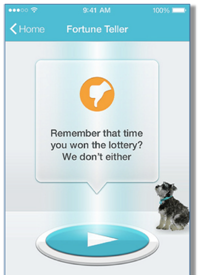 Designed to provide many of the features of traditional banking via smartphones at low cost, the mobile bank also features appealing tools for young people, such as quick balance checking (no login required) and the "Fortune Teller" tool, which analyzes whether a purchase is a good idea, based on the user's spending. Defined as "the practice of funding a project or venture by raising many small amounts of money from a large number of people, typically via the Internet", crowdfunding has enabled new ideas to become viable businesses faster than ever before. Founded in 2009, Brooklyn-based Kickstarter has funded over 55,000 creative projects. Through the Kickstarter mobile app, the crowdfunding platform offers enhanced visibility to projects, which are accessible to investors anytime, anywhere. Third parties have also developed innovative mobile solutions to simplify the use of crowdfunding. Such is the case of the FunderCloud app for iOS, which allows users to simultaneously browse projects from different platforms (Kickstarter and IndieGoGo) via categories and filters. New York Times' recently published "A Vision of the Future From Those Likely to Invent It" which highlights how technology will change the world in a not-too-distant future. Reid Hoffman, venture capitalist at Greylock and co-founder of LinkedIn, acknowledged the fast-growing field of mobile banking. He predicts that, over the next decade, "tech will unbundle banking for loans, payments, asset management and so on."